We had a wonderful time in Chicago last week. I met the most wonderful group of bloggers. We had lots of family time together, had some great food and wonderful conversation. We also learned alot of interesting things I’ll be sharing with you in 2 large posts scheduled to come in a few weeks. There’s no place like home though, and your own cooking to make you feel good, especially after catching a little cold on the plane ride home. I love this dish. I have been making these Thai peanut noodles for a while. I love making my own takeout dishes, and this one is full of fresh vegetables and delicious peanuts. It has a little spice from the Thai sweet chili sauce, but just a touch. My son had no problem gobbling down two helpings of these noodles, and he is very sensitive to spicy foods. If you want to play it safe, leave out the sweet chili sauce all together and add some honey in its place. I also used linguine, because it was what I had on hand, but you could also use the flat rice noodles. Don’t forget to like this site on facebook for exclusive giveaways. You can do it in the sidebar to your right. I am going to start to do facebook only giveaways for certain prizes. I have some fun goodies in hand I will be giving away on facebook next week. So like the site, and stay tuned for updates! Cook pasta according to package directions. Add chicken stock, peanut butter, soy sauce, Thai sweet chili sauce, rice vinegar, grated garlic and grated ginger to a large bowl. Whisk until incorporated. Preheat large skillet. Add canola and sesame oil. Add green beans and peanuts. Cook over high heat until green beans are tender crisp and peanuts have lightly browned. Add green peppers, red peppers and carrots. Cook until peppers are tender crisp. Add sauce and bring to a boil. Add pasta and cook for 2 - 3 minutes. Add fresh green onions, fresh cilantro and pour into a serving platter. Serve immediately. I’m so glad you had a nice trip to Chicago. What a wonderful city! And I also love making thai peanut noodles. There is something wonderful about the creamy and crunchy texture matched with the slightly spicy tang of the sauce. Yum! I love, love, love thai peanut noodles and the photos of your dish makes me want to jump through the screen and eat some as I sit here catching up on blog posts. My children are big fans of noodle dishes as well (they must get it from me), so I am pretty sure they will enjoy your recipe. Thanks very much! Looks so appetizing! I love the combo of veggies you used and noodles. I’m sure this is so much better than takeout. The picture is beautiful! Those noodles look amazing 🙂 Glad to here that you had a nice trip I can’t wait to hear more about it. Love that you are making all these homemade…nothing better. 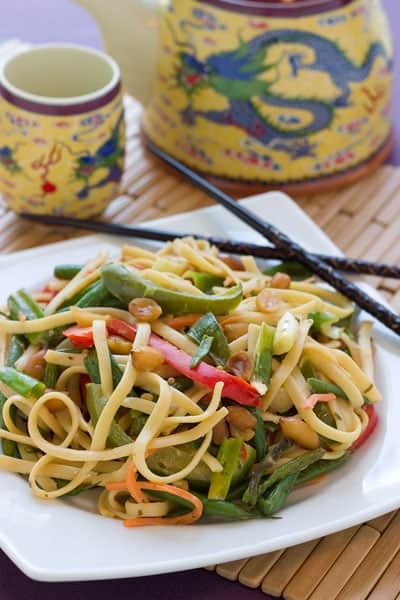 Love peanut noodles…. I wish I had this dish for lunch! sneaking peanut butter into the main course can rarely be a bad thing–your plate looks awesome! oooooooh, do I love this recipe! The idea of take-out at home is amazing! This recipe looks delicious and the photograph is stunning. I can’t normally have Thai since the cuisine has a lot of spicy dishes, but I absolutely love their peanut dishes and peanut sauces!